Will Mexico’s Record-Breaking Solar Prices Pencil Out? GTM Global Solar Analyst Manan Parikh answers some pressing questions about Mexico’s explosive solar growth. Two years after a major energy reform effort, Mexico's auctions are bringing in the lowest solar prices in the world. But getting those projects financed and built will still be a challenge. Below, we answer the most pressing questions about Mexico's solar prospects. GTM is headed to Mexico City next week to discuss how the country can ensure sustainable and healthy solar growth. Our Solar Summit Mexico will address the status of market reform, the economics of record-low bids, financing challenges for big and small projects, currency risk, and the future policy. The top developers and financiers will be there. Will you? There was a lot of uncertainty about Mexico after energy market reforms. But the reforms turned out to be good for solar. Why such positive results? The clean energy targets that went into effect this year state that 20 percent of generation must come from clean energy, with the share increasing to 35 percent by 2024. That’s one of the biggest drivers for renewables in Mexico. Solar irradiation in Mexico is among some of the best in the world. The capacity factors for strategic PV plants and DG systems are likely to have higher outputs relative to many other markets. Average global horizontal irradiation (GHI) is approximately 5 kWh/m2/day, the energy equivalent of 50x Mexico's annual national electricity generation. Seventy percent of the country has GHI values greater than 4.5 kWh/m2. Mexico's average solar resources for PV (5 kWh/m2/day) are more than 60 percent higher than the best solar in Germany, which has 5.4 gigawatts of installed PV. When the country’s wholesale market was scheduled to go into operation on January 1, 2016, developers and investors alike were uncertain of the impact the open market would have on PV in Mexico, particularly since there was a new structure in which suppliers and buyers would both have to compete. Project owners were reassured by the idea that these policies and market changes were here to stay. At our 2016 Solar Summit Mexico, we were unclear on how competitive PV would turn out to be in the auctions -- but the results after three rounds amounted to close to 6 gigawatts of utility-scale PV contracts. Mexico achieved three of the largest capacity totals in the region at declining averages of approximately $12/MWh (all $ values are USD). Furthermore, the country’s distributed solar policies increased the net metering cap to 500 kilowatts, as well as the net billing and net sale schemes for larger projects. This enables installers to access both larger commercial and small industrial projects. Large-scale users who consume more than 300 kilowatts are also able to opt out of their requirements by procuring directly from renewables, so there are opportunities for solar on the industrial side from the 500-kilowatt to 5-megawatt range. DG doubled the installed total capacity in 2017 alone by 400 megawatts. It’s important to note that utility system costs in Mexico are currently around $0.85/W. So while there are regulatory advantages to the way in which PV can structurally slot into the wholesale market, technology costs are declining to some of the lowest prices globally. Now solar projects are bidding at record lows. What are the biggest hurdles to getting these projects financed and built? Access to financing PV projects in Mexico is finally becoming a reality with development banks like Bancomext and other larger firms entering the Mexican market. In Latin America broadly, several larger-scale project deals are being taken on by large state funds and multilateral banks. Mexican development bank Nacional Financiera (Nafin) will support medium-sized energy projects with investments of between $20 million to $50 million. In some cases, this is concentrated on a state level. Nafin already supports many projects in Coahuila where it can invest in a cluster of mixed technology projects. Other banks are also getting involved, including the European Investment Bank (EIB), KfW, DEG Invest, IADB and NADB. Developing markets tend to follow the pattern of investment from development banks that can absorb the most currency and development risk, followed by multilaterals and ultimately private banks for large-scale solar. HSBC and Santander among others are beginning to take on project financing as the market matures. Leveraging lower engineering, procurement and construction costs will inevitably be the crux of being able to ensure that projects pencil out. If engineering and construction costs, as well as labor costs (relatively low in Mexico), can all be slashed to a significant extent, projects may pencil out. Modules and component prices are most certainly on a downward trend. If America's decrease in PV demand is projected to play out over the next five years due to tariffs, it’s entirely possible that Mexico will experience gains as a result. Expect an ever-growing contracted project pipeline and an emerging distributed solar market with increasing ways for end customers to lease or finance their systems. What are the biggest risks for developers and financiers moving into Mexico right now? Developers are grappling with over-competitiveness on prices. Mexico's most recent auction average of $20.84 is the lowest average price in the world for solar in a regulated auction structure (Saudi Arabia recently threw out what had been reported as a new record-low bid). With these low prices comes razor-thin margins for developers. It’s entirely likely that when prices fall below the $35/MWh threshold, developers are no longer seeing the double-digit returns that they are seeking. While the opportunities may be there for qualified suppliers and buyers in the market, the issue of bankability on the open market remains. Developers are seeking long-term PPA contracts for their projects, whereas buyers are not quite comfortable signing a 15- to 20-year PPA. They are comfortable with much shorter tenors because of the market's volatility. As such, the independent power producer market may take a bit longer to come around. The price adders in the market are also something of an unknown. There is still much to glean from the standpoint of valuing the clean energy certificates on the open market and whether merchant solar projects will provide enough of a return on the open market. In Chile, for example, spot prices dropped as a result of additional hydro capacity added to the grid, resulting in PV getting close to nothing in return. In Mexico, natural gas may push prices lower on the open market depending on how much domestic natural gas is in the system or imported from the U.S. Already, in northern border regions, where there is imported natural gas, prices are among the lowest in the country. What makes Mexico unique among other Latin American markets? Mexico finds itself at a unique crossroads both geographically and culturally. With its proximity to the U.S., it can feed off cross-border generation trades and fuel exchanges, while also maintaining cultural relationships with countries to the south. Mexico’s energy transition was unveiled in several stages, with the binding clean energy targets serving as the linchpin for solar development: Published in 2012, the law affirms Mexico’s intent to increase electricity generated from clean energy sources, including nuclear energy, to 35 percent by 2024 and 50 percent by 2050. The law also set a national goal to reduce greenhouse gas emissions by 30 percent by the end of the decade. Other markets in Latin America, most notably Chile and Argentina, have established similar benchmarks in the years since Mexico’s announcement. Mexico's market is particularly interesting because of specific carve-outs for wind and solar at 23 percent and 13 percent generation shares, respectively. Despite these carve-outs, the country is relying on subsidy-free competition between technologies jostling for market position. Thus far, solar has come out on top from a price standpoint. Regionally in Latin America, Mexico has provided a blueprint for other markets, such as Argentina, to follow when establishing clean energy requirements and overhauling sections of their electricity market structure. The economy is set to grow 2.8 percent in 2018, but with a presidential election coming later this year, there is some uneasiness regarding whether a new administration will disrupt the electricity sector's overhaul. Overall, the outlook remains strong for Mexico because of the regulatory structure that remains in place. 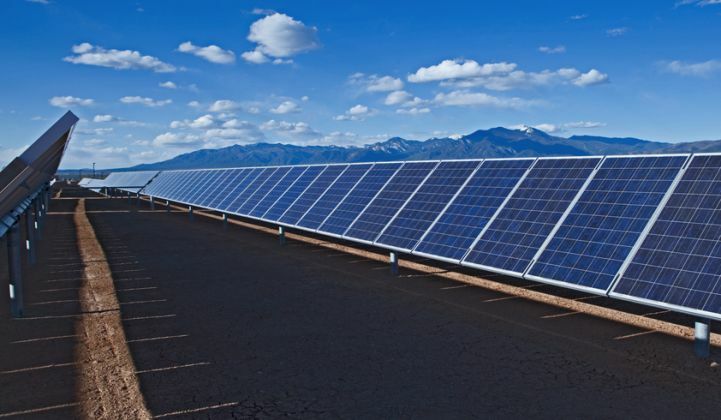 GTM Research forecasts that the Mexican market will add around 15 gigawatts of additional PV by 2022, putting it well within the top 10 of global markets. In 2018, GTM events will be bigger than ever, focusing on content that drives deeper understanding of our core markets, connecting industry thought leaders with their peers. Each agenda is curated by world-class research and news teams, bringing the content to life. Join us to stay at the forefront of the conversations and big industry trends. Check out this short video to learn more about what to expect at a GTM event. Enterprise Pass: We're offering a bulk discount when you purchase multiple tickets simultaneously. Planning on attending more than one GTM event this year? Want to send five employees at your company to an upcoming event or purchase passes to give away to clients? We'd like to save you some money in 2018. To purchase an enterprise pass, click here.